I knew I had to have it. 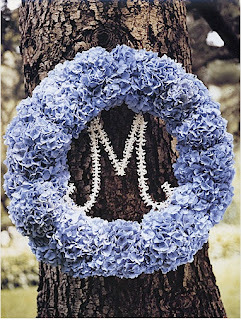 The wreath doesn't get enough credit in floral decor, due to, I believe, the overabundance of crafty ladies at Michael's constructing them out of silk flowers and ivy. I have always been a big fan of a pretty wreath, but you do need to be careful not to stray too far into "something my grandma made" category. I think you do this by sticking to one flower/leaf/branch and only varying from that in the color of that flower. 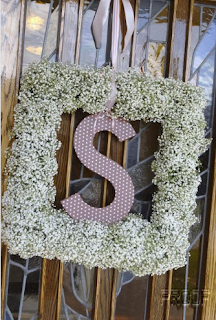 I really wanted white floral wreaths hanging from the huge, gorgeous front doors of our church. Unfortunately because it is an older church (built in 1918) and is very beloved by its parish, they have very strict rules about how you can decorate within the church. Since it is generally pretty ornate, I am not too worried about having large floral displays near the front doors or the alter. I am pretty sad about the wreaths however. Yes, that is baby's breath. Yes, I normally rip baby's breath out of bouquets as soon as they are handed to me. It ranks right up there with the dreaded carnation. But doesn't it being on its own make a big difference? I think it has a vintage feel to it. Lots of texture and movement. Its white, which is key when the church has 1.2 million colors painted in the frescoes. Oh yeah, and its dirt cheap. Nice!